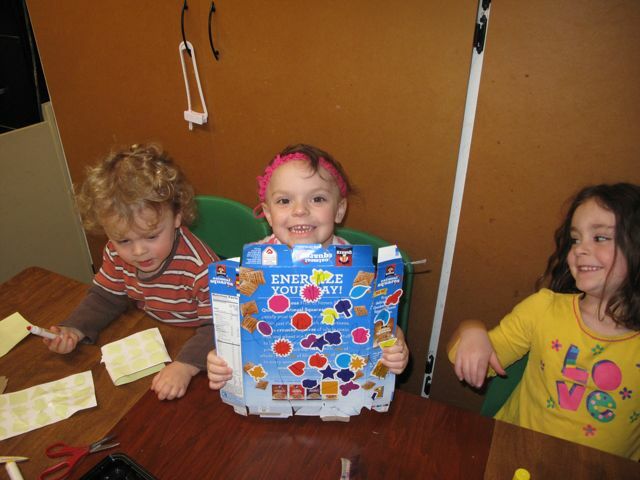 Christian created this masterpiece while chanting methodically, “My mama is going to love this!” With every sticker, each fringe cut on the cereal box, and all the letters written (there is a whole alphabet of Christan’s invented spelling on the reverse side), her excitement grew. My mama is going to LOVE this! She beamed as she finished her creation, and when it was done and sitting patiently in her cubby waiting for it’s beloved recipient to arrive, Christian visited periodically to gaze admiringly at the finished product, and to occasionally add an embellishment here or there that she found lacking in the form of a stray googly eye or a piece of cut yarn. With so much attention paid during the course of a day waiting, the piece lost some of its extras, but it was with a heart bursting of love that Christian presented it at the end of the day to her mama who received the gift in the spirit in which it was intended – matching love for love – and thus offering back to her daughter what was most desired. The choice of what happens with the artwork is one that must be left up to the creator – it is a question I ask at the end of each art exploration time. “Is this something you would like to save to take home? Or was this practice and would you like to put it in the trash?” Children need to hear that they have the freedom to choose. I often create things that are practice, and I want the option to throw it away! But, I don’t want anyone else to judge whether my creation was fridge-worthy or trash-bound. How devastating would it be for a child who has worked hard on something to find it in the trash? Surely keeping and displaying everything that comes home would be an impossibility! (I know…I watch the quantities of materials that are destined for home!) One option is to have a rotating display area for one piece of artwork (think refrigerator) and a shoebox or a large artist’s portfolio to house the items that are taken off of display. Allowing children to make the choice between items that should be saved and items that have completed their purpose gives them the power to continue creating. Every so often, it is fun to pull all of the pieces out of the shoebox and reflect on the artistic and creative growth! 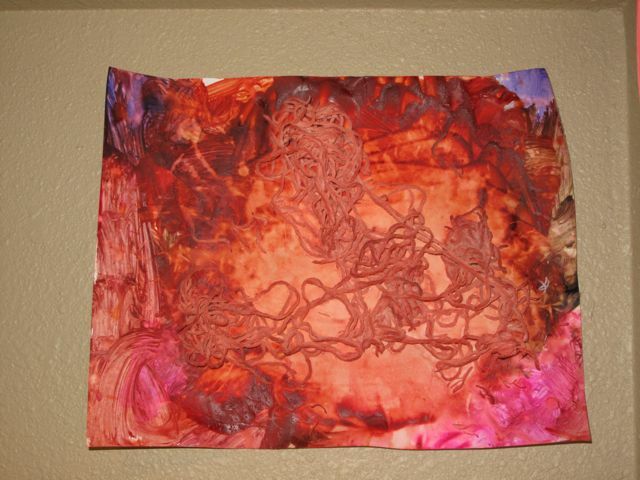 Another option is to photograph art pieces to save a memory of what children create. This option is especially useful for three-dimensional artwork that is difficult to save. Artwork offerings raise another interesting question in early childhood development. How do we authentically honor a child’s creation and open the space for pride to blossom? In meeting a child in those proud moments, we wield the power to help children discover their own self confidence or engender dependency on the approval of the significant people in their lives. Consider this example. A child is laboring over a piece of paper, crayons spread out on the table in front of her. I swoop in and say, “Oh, I love your drawing!” Now, what if that child was not pleased with her drawing? What if she was frustrated with the product? In my comment, I have limited her ability to interact authentically with the piece, because I said that I liked it. And being that I am an important person in that child’s life, she is forced to reexamine her initial misgivings about the piece in light of my assessment. Consider instead, “Tell me about your drawing. You are working so hard on it.” She now as the opportunity to reflect about the strengths and challenges of her creation. When presented with a masterpiece, often our first (and most heartfelt) impulse is to offer an assessment: “I love it!” And we do love it! But if we can alter our language a bit to allow for the child to be the first one to evaluate the gift, saying something like, “Tell me about what you made! I can tell you worked so hard on it!” we can return the child’s gift of artwork with our own gift of unconditional listening. In so doing, we nurture a reflective and thoughtful spirit of creativity. Be proud in what you’ve done. And yes, your mama will love it. 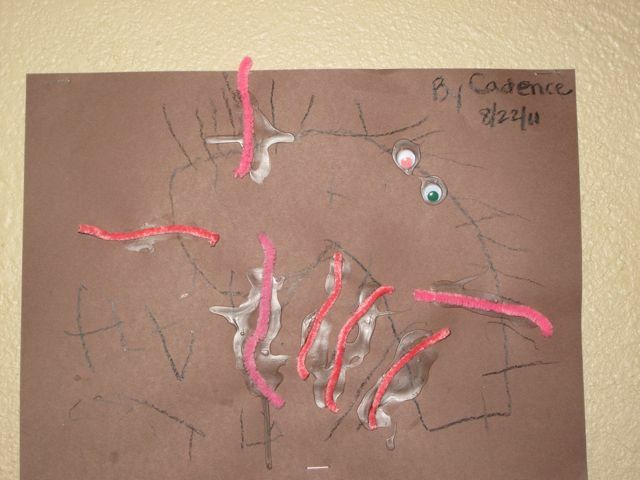 Do you have memories of artistic explorations as a child? Do you still have any of your childhood artwork? My mom saved an artists portfolio for me from preschool on. How fun to pull it out as an adult and remember those experiences. Another wonderful post! In answer to your question, some of my young artistic works from 25 years ago are still hanging in my parents’ home. Specifically, there is a self-portrait I painted and I smile every time I see it! While everything a child creates cannot be displayed (because of space restrictions…and personal taste! ), there is something wonderful about seeing my creations claiming prime wall space in my folks’ home.